As Enoch Powell warned in the House of Commons 25-Feb-1970 (Text: CLICK HERE) the aim in forming the EEC (subsequently the EU) was a Federal Govenment with a single currency, without National borders administered through Regional Seats of Power, politically integrated with a common economy and unified military etc. etc. – Moving towards a One World Government. A crazy form of socialist communism for a post democratic era! When growth did happen, it did not come from the EU. From Ludwig Erhard’s supply-side reforms in West Germany in 1948 toThatcher’s privatisation of nationalised industry in the Eighties, European growth came from reforms introduced by individual countries which were were copied elsewhere. EU policy has always been either irrelevant or positively detrimental (as was the case with the euro). Monnet’s Action Committee was also given financial backing by theCIA and the US State Department. The Anglo-American establishment was now committed to the creation of a federal United States of Europe. Sadly when Alan Skedd left Ukip that was the end of any desire of the new leadership and subsequent management to give any consideration to understanding what was going on and working with any sort of strategy to extricate Britain from this crazy experiment in 19th. Century Empire building! 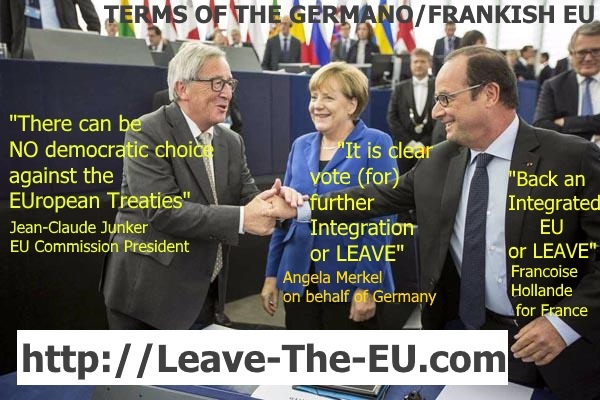 Previous Previous post: GP > RN – A New, Updated, Better Negotiated ‘Norway Option’ Is The Way To Leave_The_EU.